I’ve always wondered how easy or hard it would be to make eclairs so this week I’m going to try them out. Eclairs made but I do think they need a bit more practise. They taste like an eclair and I’ve eaten three on my own so they can’t be bad!! It’s the shape that I don’t seem to have got right. I did as my follower Janet said, dust the greased baking sheet with flour and with my finger draw an outline of the shape and size I want the eclair to be (a template really). I did that but between piping them out and taking them out of the oven they went from long fingers to round balls. Only me as Mami says!! 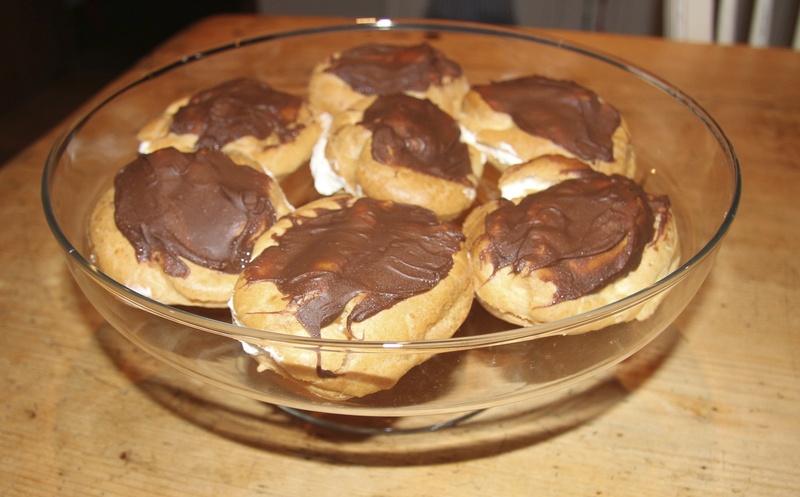 What I did learn is that as there is no rising agent in choux pastry they rise from the steam created by the moist mixture ………………… interesting. Back tomorrow with my bake for next week. they’re yummy!! try making them and bring them into school! !